Terex’s Skip Loader, the TX650 or 650B, is a very popular lower cost option for contractors or homeowners looking to get the best machine for their money. The 650 is one of the best skip loaders on the market today and offers unmatched power and performance for the price. When your looking to save money on a machine such as a skip loader its important to save money on tires as well, Monster Tires is here to offer you excellent prices and service on any tires you need for your Terex Skip Loader.Dependability and Reliability with Monster Tires for all your Tire needs on Terex Skip Loaders. When you buy Terex Skip Loader Tires from Monster Tires, you are getting a promise of dependability and reliability. You need to be able to rely on your Terex Skip Loader tires, because these are what keep your construction job moving forward and your work site safe. We stock 650 – TX650 Skip Loader Tires to cover all your Terex Skip Loader Tire Size Options. 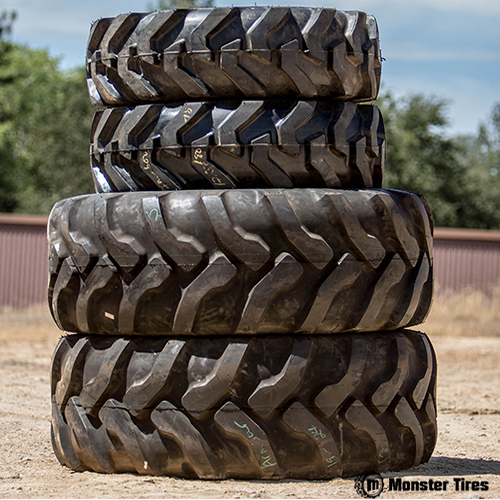 Whether you are looking for a Set of four tires for Terex Skip Loader, or just a front tire set for Terex Skip Loader or a Rear Tire Set for Terex Skip Loader, we have the high quality, dependable, and reliable tires you need here at Monster Tire! First Class Service and Staff Support from Monster Tires. It wouldn’t be a great customer experience if you didn’t have a great support and customer service team. Here at Monster Tires, our customers are our greatest asset and we treat you that way. We are here to answer all your questions about your Construction Tread Tires for Terex Skip Loader, OTR Tires for Terex Skip Loader, and Off the Road Tires for Terex Skip Loader. If you need Heavy Equipment Tires to get your piece of equipment rolling again, Monster Tires has the tires for you. Trust in Monster Tires for your next set of Terex Skip Loader tires!